A Proud New Addition to the Family! Say ‘hello’ to Levitt-Safety’s newest mobile safety vehicles. 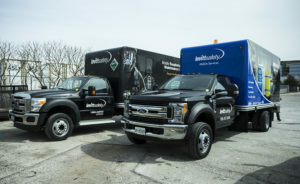 Late last month, Levitt-Safety became a proud parent to two brand-new, state-of-the-art mobile safety service vehicles. We know – big deal, right? A few new trucks on the road doesn’t sound particularly exciting. 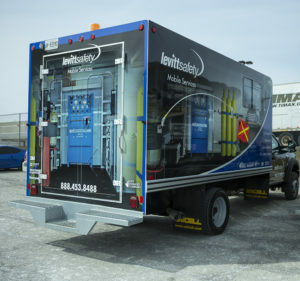 But what has us so excited about these two vehicles is that they’re the very first of their kind in Canada – and they’re going to revolutionize the way Levitt-Safety is able to deliver services to our customers. Also, in the coming weeks we’ll be adding the capabilities we need to perform complete self-retracting lifeline (SRL) and tripod inspections and re-certification! Talk about a one-stop-shop. The introduction of these new vehicles into our services fleet is huge for you, our customer. We’ll be able to reduce the amount of downtime you normally experience when returning a product to a service center. And since you won’t be waiting for the product to ship back and forth between locations, you won’t lose any additional productivity while your repair is in rotation prior to returning. When you employ our mobile safety vehicles, you’re better able to manage your fleet of equipment from a budgeting a life-cycle perspective. Not sure how that works? Take a medium sized fire department with 50 SCBA’s, for example. This FD may have SCBA units spread across multiple locations. Obviously, in an industry like fire suppression, you can’t be without your respiratory protection equipment, and sending the units off-site for service at quantities of two or three at a time would take months. With our new mobile services vehicles, we can test and repair of all of your units in a matter of days, right at your site! We’ve all heard about the benefits of vendor consolidation and the efficiencies that can be gained in dealing with a single source for your safety services. 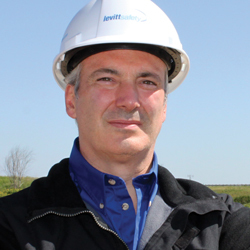 Levitt-Safety is truly is that one-stop-shop for our customers, and we’re committed to seeing you through the entire lifecycle of your safety products. Whether it’s your respiratory protection, confined space entry and rescue equipment – or anything in between – we’ve got you covered. Want to learn more about our mobile safety services? Check out the website now! And if you’d like to book your own service appointment, contact us today. Update: We’re delighted to announce that we have won the 3M Graphics Award in the Straight Truck category for these trucks! We’d like to give a big thank you to 3M for the wonderful recognition.